There isn’t a bigger name in sports gaming than John Madden. Now the famed color commentator and namesake of the best-selling sports gaming franchise of all time is coming to the iPhone. Boom! Get ready for bruising tackles, game-changing catches, and clever strategies on your mobile platform. Gonna Do It for Their Super Fans: Madden NFL 10 features real players from real teams with officially licensed logos playing in real stadiums. People forget that before you could become your own general manager of your team, nitpicking every detail from making trades to drawing up plays, the Madden series had a home on two- to four-button consoles and even the Apple II. 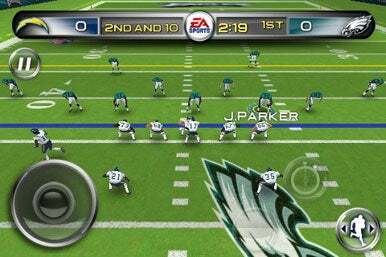 So it shouldn’t be surprising that the Madden NFL series of games has found a home on the simple interface of the iPhone. There isn’t a franchise mode or some of the more nuanced trappings of the series, but Madden NFL 10 from Electronic Arts still offers some of the most realistic football action you’ll find. Whether you enjoy commanding your defensive corps to disrupt opposing offensives or enjoy throwing the long ball for game-changing touchdowns, Madden NFL 10 will satisfy you. Featuring commentary, a rock soundtrack, every professional stadium, deep rosters, and officially licensed logos and teams, Madden NFL 10 for the iPhone lives up to the Madden name. It’s easy to play offensive coordinator by setting up formations, plays, substitutions, or “hot routes” by either tapping or dragging your finger across the screen. With the tap of your finger, you can also engage in cinema view before the snap to give you a wider view of the play before it happens. Once you take control of the ball carrier, it’s a real joy to slow down time with a click of a button and then quickly decide what spin, juke, or speed move you want to engage in. A small joystick in the corner makes movement easy and allows virtually anyone to pick up the game and enjoy it. It takes some getting used to in order to time your agility commands to be the most effective, but I find the variety and strategy of the actions plenty engaging and very true to life. If you’re a big fan of Eli Manning or Drew Brees, the quarterback control system will leave you happy. Thanks to the color-coded receiver reticules, it’s easy to see which of your players are open when utilizing a passing play. Unlike Madden games in the early ’90s, you can’t just wait for your receiver to get open and then throw a 70-yard touchdown. Players have limitations in their abilities and the opposing defense will smother your quarterback quickly. The teams play like they would in real life, so don’t expect an easy season if you choose to play as the Lions. I played as the Bills and all of their receivers (save for T.O.) couldn’t catch a cold, while the running back (Marshawn Lynch, in case you haven’t committed the Bills’ roster to memory) was serviceable. On the other hand, playing as the Colts or Cardinals will afford you better completion percentages, and your wide receivers won’t keep dropping the ball for seemingly no reason. Pass Happy: One of the quirks in this initial Madden NFL release is that your computerized opponent will be throwing more often than not. Plan your defensive schemes accordingly. The opposing AI needs to go back to training camp, however. On offense, throwing is a challenge (as it should be) but opposing defenses never know how to respond to pitches and certain running plays. On defense, you can pick the most carefully crafted defensive plan you want, but your opponent’s offense will almost exclusively throw. Unless its third and short or you leave the middle completely open, expect a throw. Stopping an air attack is a simple matter of slowing down time and then quickly hitting one of the defensive buttons. Your opponent will still put up points, but it seems odd that in the games I played, my computerized opponent only used running plays 10 percent of the time. This design quirk will hopefully be addressed in an upcoming update because right now, the game’s difficulty level is cake. The sound management is a bit buggy at the moment, with the ability to upload tracks from your device a nice feature, but the process of adding specific tracks (and excluding others) and then playing them can be wonky. Still, I enjoyed rocking out to my metal soundtrack while I completely dominated the NFC East. I relied on my collection of iTunes songs because I couldn’t stand the commentary. The programmed lines are repetitive and only occur in very specific situations. After Madden tells you about how the pass looked good but he didn’t catch it for the umpteenth time, you’ll go to the options menu and turn the commentary volume to zero. The graphics aren’t nearly as crisp or detailed as something you’d see on a console, but they’re plenty pretty for the iPhone platform. You’ll find the character models to be generic and stiff, but the logos and menus are crisp and clean. The graphical complexity is slightly above Real Soccer 2009, the other great iPhone sports game I’ve reviewed in the last few months. Madden NFL 10 gets the spirit and feel of the Madden franchise right. Football fans new and old will enjoy the simple control scheme, addictive and action-packed gameplay, and true-to-life players, teams, and stadiums. The music loading ability is a welcome addition to the game and really compensates for some subpar commentary and sound effects, and the promised multiplayer ability will only make this game better over time. Aside for some spotty AI strategies, EA has done a bang up job of creating a fun port of the most popular sports franchise of all time. 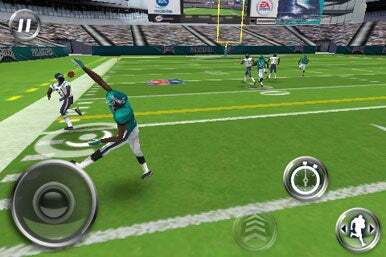 Madden NFL 10 is compatible with the iPhone and iPod touch running the iPhone 2.2.1 software update. Updated to reflect Madden NFL 10’s price change after we first published this review.